This vicarage is a pleasant architectural surprise on the way to the church at Great Tew, different from, but complementary to, the thatched cottages that make up much of the village – although a vicarage on the way to a church is hardly a surprise. The house was originally built in 1696 and has been altered and expanded several times since, notably in the early-19th century, when such features as the bold surrounds to the windows were added. Actually these bands of limestone are not quite as bold as they might appear in the photograph, because when you look at them closely, there are very narrow roll mouldings around the insides of the surrounds, reducing and softening their bulk in a rather pleasing way. The ornamental wall in front of the house is hardly ‘spare’, although it is dappled, in a sort of fish-scale pattern. This works well. The lower, solid part of the wall retains the rising ground behind, while the fish-scale patterned part acts as the stone equivalent of a garden fence, defining the boundary and letting light through at the same time. This wall is probably early-19th century too and manages to combine strength and delicacy in a single structure. A small architectural mercy. Glory be to God for it…or to its architect and builder anyway. *See Gerard Manley Hopkins, ‘Pied Beauty’ (‘Glory be to God for dappled things…’). Edward Bawden (1903–89) is probably one of the best loved of British illustrators. His work, from glorious big linocuts like the one he did of there interior of Liverpool Street Station to his tiny lithographic illustrations for the King Penguin Life in an English Village, from London transport posters to adverts for Twinings Tea, will be familiar to many readers. And Bawden has been made more familiar by books such as Malcolm Yorke’s lavish Edward Bawden and His Circle* and smaller glories like Peyton Skipwith’s One Lump or Two,† on Bawden’s work for Twinings. But sorting through a pile of old Architectural Reviews of the 1940s I was pleased to come across a couple of Bawden’s illustrations that I’d not seen before. They are from a series of advertisements for the Zinc Development Association promoting new building in the post-war period and the use of zinc (for roofing, flashings, and so on) in new buildings. Each advertisement covers a specific building type and begins with the line ‘We need new…’. The two I found were ‘We need new hospitals’ (above) and ‘We need new houses…’ (below). And roofed with zinc, of course. §My thanks to a reader, Mike Rigby, who has pointed out the similarity of the porticoed frontage of Bawden's hospital to the General Hospital in Cheltenham, precisely the hospital I had in mind. Apparently Bawden was in Cheltenham in 1946, so the similarity may well not be a coincidence. I’ve driven quite often along the A37, the road that links Bristol with Shepton Mallet and Yeovil, and more than once I’ve admired the village of Pensford, where the church tower is set against a background of stone houses and a railway viaduct. The other day I had time to stop there and take a look. Tucked away by a triangle of grass at the junction of two roads I found this lock-up, beginning to disappear among the greenery. I’ve posted about lock-ups before and have found examples ranging from tiny anonymous cells so small you can hardly see them to one artfully built in the form of an elongated pyramid. This one is also quite artful. 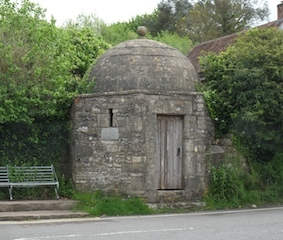 It’s an octagonal structure with a domed roof culminating in a ball finial. With its tiny window and cold stone walls, it couldn’t have been a pleasant place to spend the night – especially if you were recovering from a drinking spree or a fight. But at least the little building’s form adds up to something good to look at from the outside – a symbol, perhaps, not just of authority but also of 18th-century village pride. Among the dozens of carvings on the outside aisle walls of the church at Adderbury in Oxfordshire are several representing musicians. Although time-worn (they’re 14th-century, after all), they still bear some detail, and it’s possible to make out what instruments are being played. And I know I have at least one reader who knows plenty more about early instruments than i do, who’ll no doubt put me right if I slip up. Next is a man playing a hurdy-gurdy. There’s not much clear detail left in the carving, but the instrument has a crank-handle, which the player turns using his right hand. This turns a wheel, which rubs against strings that run along the top of the hurdy-gurdy. Some of the strings sound whenever the wheel turns, to provide a continuous note or drone; another string is controlled by a keyboard, to play the melody. None of this is clear in the carving, but there’s a video here of a hurdy-gurdy player explaining how his instrument works – as well as the derivation of its curious name. Another carving shows a string player. I think the instrument is a rebec, which is played with a bow, like a violin. It has a pear-shaped body that tapers into the neck and was held in various ways – along the arm or at the shoulder or even resting on the player’s leg. Finally, the rhythm section is represented by this drummer. He plays a pair of drums, which the carver has shown quite large – bigger than the drummer’s head, anyway. Pairs of drums (including the small copper-bowled drums called nakers) were often played in the Middle Ages. These seem to be snare drums – the thin gut snare is clearly visible on the left-hand drum and I think I can see a trace of one on the right-hand drum too. * Although in many cases we don't know exactly which instruments played which pieces – medieval music manuscripts often give the notes without allocating them to a specific instrument. 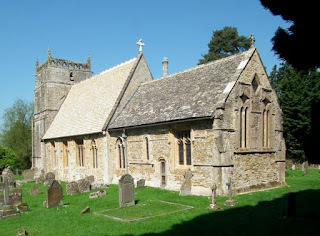 I always think the best part of Adderbury church is the exterior. It has a glorious spire, some outstanding window tracery (much of it renewed during a Victorian restoration), and a riot of 14th-century carving running around the building at cornice level. I wanted to highlight just one of these carvings (although I hope to return to them in another post and feature some more), because Adderbury has the female counterpart of the mermen I included in my previous post about Anstey in Hertfordshire: a lovely stone mermaid, showing off her bifurcated tail. This mermaid, although somewhat worn in the six hundred years or so that she’s been here, still clearly has long hair, the feature emphasized in the typical medieval portrayals of mermaids holding combs and mirrors, and like those attributes a symbol of physical beauty and vanity. But Adderbury’s mermaid holds no comb or mirror, her hands are occupied grasping the two branches of her tail, like the mermen of Anstey. The branches stretch outwards and upwards, to fit exactly the moulding that contains the carving, so that the mermaid feels perfectly at home in her place high on the church wall. For the people of Adderbury in the 14th century, she must have been a lovely and intriguing hint of life in a place of which they knew little: the far-distant sea. My recent visit to Anstey in Hertfordshire has already yielded one post, about the unusual lychgate at the entrance to the churchyard. One of the other surprises of the place was inside the church – this striking carved font, which probably dates to the very late 12th century or early 13th century. * The carving portrays a quartet of mermen with tails that divide in two and curl upwards so that the mermen can grasp the ends in their hands. This form of divided tail is quite common in medieval depictions of mermaids, but I don’t remember having seen mermen like this before, although apparently there’s a similar font in St Peter’s church in Cambridge, which I visited a very long time ago. Mermaids are altogether rather more common in medieval art than their male counterparts. Often shown carrying mirrors and combs, they were symbols of vanity and were also seen as posing a danger to sailors.† So there are mermaids in roof bosses, in woodcarvings, and in the water through which St Christopher wades bearing the Christ child as he goes, in many a medieval wall painting. Mermen didn’t carry such a heavy moral message and don’t appear to have been portrayed so often. They seem an odd choice for a font, where the decoration more often shows the sacraments, or a scene of Baptism, or simply abstract patterns or tracery. Perhaps some contrast is being implied between the wild creatures that dwell in the open ocean and the protected and sanctified bowl of the font, which will be filled with holy water. Be that as it may, the mermen of Anstey, with their bold, if rather simple carving, make the font stand out. *This is the date range given on the excellent Corpus of Romanesque Sculpture in Britain and Ireland website; the writers base their estimate on the style of the carving. †There seems to have been some confusion between mermaids and the sirens of classical myth too. 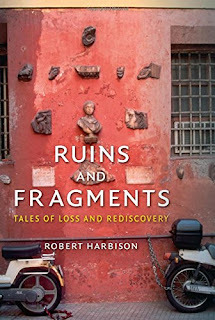 Robert Harbison’s recent book explores questions about our reactions to ruins – why we are fascinated by them, why they are sometimes more satisfying to look at and think about than structures that are pristine or new. Harbison ranges widely, covering not just the expected old ruined buildings but also fragments of antique statuary that wash up in odd places, modernist ruins such as St Peter’s Seminary at Cardross, Scotland, and buildings that look as if they’re ruined, but aren’t. He has interesting reflections on reconstructions of various sorts, including Shakespeare’s Globe Theatre in London, Warsaw as rebuilt after World War II, and Colonial Williamsburg. There are absorbing accounts of buildings that had long intrigued me, such as the Castelvecchio Museum in Verona, where architect Carlo Scarpa removed part of the existing structure to reveal the fragmentary medieval town ramparts behind, then attached his elegant modern additions to produce a building that’s both beautiful and functional as a museum. 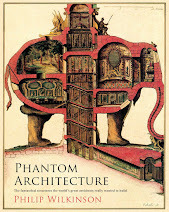 The book’s scope is not limited to architecture. There’s a chapter on ‘Interrupted texts’ (Coleridge’s Kubla Khan, Montaigne’s Essays, Burton’s The Anatomy of Melancholy) and another on ‘Ruined Narratives’ (Sterne’s Tristram Shandy and Joyce’s Finnegans Wake). There’s also quite a bit on sculpture and painting, portraying cubism as an art of destruction (I’m not sure I go all the way with that) and setting the structures of Gordon Matta-Clark and Kurt Schwitters’ Merzbau against the baroque quasi-ruin of Sir John Soane’s house in Lincoln’s Inn Fields. He also writes about iconoclasm, presenting 17th-century church-defacers and modern graffiti artists, and about the art and destruction of war, invoking poetic works such as David Jones’s In Parenthesis and Christopher Logue’s spellbinding (though sometimes far from Homeric) version of Homer’s Iliad – and placing these beside the celebrated and much reproduced late-classical statue, The Dying Gaul. * And back, indeed, to Old English poetry. † Or, yes, use the ‘Look inside’ feature on Amazon. My next review in this spring's selection is a collection of essays about the country house, with a particular emphasis on owners as consumers. It makes for fascinating reading. This is an impressive collection of essays about country houses and the ways their inhabitants furnished them and bought the other things they needed and wanted. 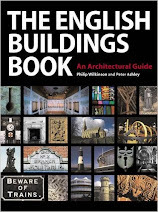 When I saw the book in Historic England’s catalogue it immediately caught my eye – as someone who has written about both architecture and the history of retailing it seemed ideal for me. * And I was gripped. It’s a large book, full of new research, and a short review like this can only skim its surface. I mention here just a selection of the essays, the ones that especially engaged me – but there is something in every essay (including the handful on overseas houses) to fascinate people who want to find out more about the lives of the owners of these great buildings. One key question posed by the book is: Where did the owners of country houses buy their furnishings and consumer goods? Jane Whittle looks at one family – the Le Stranges of Hunstanton – and shows how their household accounts reveal sources in Norwich and Kings Lynn in addition to London, as well as revealing when the family began to acquire such fashionable goods as clocks, window curtains, and upholstered furniture. A piece by Jon Stobart and Mark Rothery studies two notable houses – Stoneleigh Abbey and Arbury Hall – and finds that one shouldn’t assume that luxuries come from London and everyday supplies from local sources. Some luxuries were bought locally, and the purchasers also exploited family links with other areas or bought things from towns, such as Bath, which they visited for pleasure. Some of the most interesting essays cover the relationship between the country house and the cultures of Asia. Emile de Bruijn’s piece on the development of chinoiserie (associated variously with high-mindedness or whimsy, wise government or foolish princes, the feminine identity or effeminacy; Kate Smith’s piece on objects from India, showing the varied and accumulating meanings that these items acquired; Patricia F Ferguson’s study of the use of ‘Japan China’ among elite consumers are all absorbing examples. 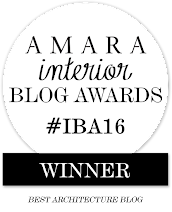 Another group of essays explores the lives lived in country houses and in specific rooms. Susan Jenkins reveals the library at Kenwood as a room for entertainment as well as a space for books. Rosie MacArthur describes the changing uses of rooms at Kelmarsh Hall as the family moved in before the building was completed. 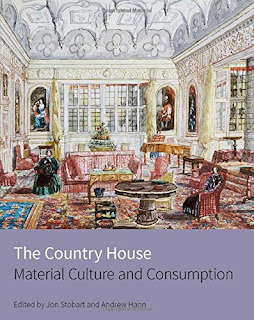 A final section includes studies of the ways country houses have been presented, including the evolving visitor experience at Stowe (Anna McEvoy) and the distinctive mix of magnificence and luxury, conspicuous consumption and art, wealth and power at Mentmore (Nicola Pickering). The last essay of all, by Karen Fielder, is particularly haunting. It concerns the traces of the lost country house of Coleshill, a place I’ve written about more than once on this blog. It shows how the presence of the house is still powerful in its absence, a moving reminder of the enduring fascination and power of country houses and the families that lived and entertained in them. * Potential readers should note that this is a scholarly book with a price-tag in line with the limited market that this sort of work commands. † My two most recent posts on Coleshill are about: surviving gate piers (noting my indebtedness to Karen Fielder’s essay) and cottages built on the estate. ‘KEEP CALM AND CARRY ON’. The slogan is everywhere: mugs, tea towels, post cards. It has spawned punning variants and look-alikes too. It’s so ubiquitous that we often forget (if we knew) that the original poster was never actually used by the government – the fact that we know about it at all is due to the chance survival of a single printed proof discovered and reproduced (and badly imitated)…ad nauseam. 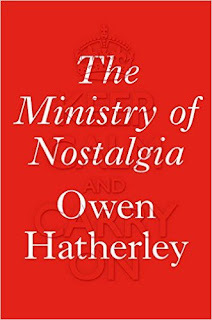 Owen Hatherley, for one, is nauseated by it because for him, as he explains in The Ministry of Nostalgia, its revival is part of a falsification of history perpetrated in order to bolster the austerity of our own times. The ‘austerity years’ of the 1940s and 1950s, the ‘make do and mend’ ethic (and aesthetic), are being repackaged, he argues, and offered to us as a consolation for neoliberalism’s violence, the deprivations of today, and ‘the privatisation of our common wealth’. Hatherley makes some good points in the course of his polemic. The 1940s and 1950s austerity years were very different from our own. While recovering from a world war, the country constructed a welfare state and, growing up in the 1960s, I for one have reason to look back gratefully to the housing and educational provisions that it created. To sum up the 1950s as all bland art, sans-serif posters, stylish but old-fashioned clothes, and a bit of suffering, and to identify it with the very different austerity of today, with its selling off of public assets and its increasing (rather than decreasing) gap between the rich and the poor, is crass, and Hatherley is right to point that out. He's interesting, too, on the way both ‘blue Labour’ and ‘red Tory’ movements have drawn on the sort of selective nostalgia that this view of the post-war period represents. I reserve my right, however, to look back at the good aspects of the period with a clear conscience. Eric Ravilious, of all people, was continuously portraying the hard edges to country life – the chalk downs with their thin soil, bare cottage rooms, tin huts, junk in corners, telegraph wires. And interwar graphic design was often outstanding – even if it was, as Hatherley revealingly explains, not just put to the service of fine organizations like London Transport but also made to serve the sometimes racist agenda of the Empire Marketing Board. And then there’s the architecture. As one has come to expect from Hatherley, there’s an enthusiasm for post-war concrete buildings created by people who wanted to bring good design to the masses. But there’s also a willingness to see the good in ‘austerity’ building – and I’m impressed that he admires not just the rebarbative constructions of the Brutalists but also neo-Georgian LCC flats, civilized and durable as they are. There are well designed Brutalist buildings and decent neo-Georgian ones: if we can only see good in one or the other we should get the blinkers off. Hatherley also has important points to make about the revamping of formerly public housing for sale to private owners – while architecture enthusiasts cheer at the preservation of blocks such as Denys Lasdun’s Keeling House, he mourns their passing out of the public sector as yet more of the less well off find it impossible to get a toe-hold in London. So I’ll offer three cheers to Hatherley for raising these points, while also lifting a glass to the things from the 1940s and 1950s that we rightly admire: the Penguin book covers, the better council flats, the good state schools, the paintings of Eric Ravilious, London Transport’s graphics, the health service. Let’s see all these things clearly – and not let go of the good that still survives. *I must say that when I read Alexandra Harris's book I did wonder what Bowen and Waugh were doing in it. By concentrating on the rather obvious target of their country house writing I think too that Owen Hatherley misses a lot, from Bowen especially.